Here's my toothed belt design for Mendelssohn using the Darwin-style moulded gear. I've turned Mendelssohn on its side, so you can see the Y axis workings clearly. I'm just using the NEMA17 to drive this at 250mA, so it won't get hot enough to melt the CAPA. The belt is the E-SKY model helicopter belt, and there is just the right length once you've cut the loop. The big silver idler is a 608 bearing and 2x ridiculous washers as per the Z idler. The less heavily loaded small belt guide is an M4 soft, black plastic spacer between two M4x11 washers (plenty of lubricant). 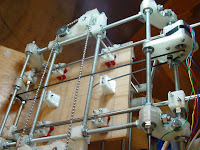 The belt is clamped by printed pillars (shout up if anyone wants the design files BTW), each held by 2 M4x40mm screws. The base itself is 230x230x9mm MDF, supported on 16 x M4x40mm countersunk screws clad in 20mm lengths of stiff rubber tubing. These go into 4 PLA pads, which can also be hand-formed from CAPA. These pads have a very low friction, and can be levelled individually to cope with quite gross manufacturing flaws :) The axis moves at 50mm/s very smoothly with plenty in reserve even at 250mA. Yes, bearings will move much smother and faster with less wear. But this seems to work for now so I'll move on to butchering the X axis. Is the idea with Mendelssohn to tackle the support material problem? It seems like a lot of time is being spent working around the lack of capability the machine has in order to be able to build another machine which has the same capacity. I realize this is a more robust design than Darwin and even than the McWire design and possibly the MakerBot. But, aside from being more robust, does it offer any fabrication benefits that the others cannot match? I heard that it has a tool head changer in the works too. Will that be on your prototype? I guess what I'm really asking is, is the Darwin simply being refined or is this a quantitatively more capable machine? Your work is excellent by the way. It looks fantastic and the speed increase will be greatly appreciated! Mendelsson is a Wedge prototype that could be a Mendel. At present it's just testing out the basic structure. Support material is not a Mendel issue per se - support material will work just as well on a Darwin. The key advantages so far are that it is much easier to construct, has a higher proportion of self-made parts, a lower proportion of obscure parts, uses fewer sizes of bolts, less smooth steel, and can change size easier. When the head-changer is ready, I'll have a go at fitting it. Right now I'm working on basics. Looking closer at that pic Vik, I can see that there isn't much space between the Y belt and the cross rods connecting the Z axis to the base. If its that close then maybe using a bearing there would be a good idea otherwise the belt may wear out too soon. Another point I can see in that picture now its easier to see is that 4th bearing with the flat washers on either side seems to be just the right about of idlers to tension that belt/chain. The head changer Vik, is it an automatic head changer? I think the ease of construction is a huge/important issue to tackle. As nophead pointed out somewhere, most people are still spending a lot of time designing work arounds to make a 'strap out of hardware store parts instead of designing printable parts for the same purpose. This, for me, is exactly true. With an easier to construct machine, this need goes away. Easy of construction by itself is a perfect reason to do another design. Thanks for answering my questions! You can just about get a copy of Microsoft Business Ethics between the belt and the strut. It might pay for us to move the motor and idler holes fractionally. The head-changer is not my department yet, I'm afraid - staying focused is hard sometimes! I'll be doing some tests later to see if it's practical to use the Z axis for head-changing though and I do have a 2-head X carriage design as backup. i think your work is amazing! thanks for keeping us excited! we are building a 'strap in barcelona, spain! hopefully we will be able to print a mendelssohn! Great to see the skids works with a nema 17! Good old PLA. Bit of an angle on that belt though! Is that intentional to provide down force? Or was it a geometry constraint? It does introduce non-linearity in distance travelled per step which is a tad dodge... how do you feel about entraining more 608's? We need to talk about mechanical branches asap. @blablab: Thanks for the enthusiasm! Good ideas are nothing without optimism.